There are 15 different key signatures in music so how do we figure out which ones have sharps and which ones have flats? How do we know how many sharps and flats they have? And where do the minor keys fit in? We’ll answer all these questions and others like them thanks to a few simple patterns that occur within key signatures. Once we know these patterns, it becomes quite easy to read, understand and figure out key signatures. In this lesson, we will even create a table of key signatures from scratch! 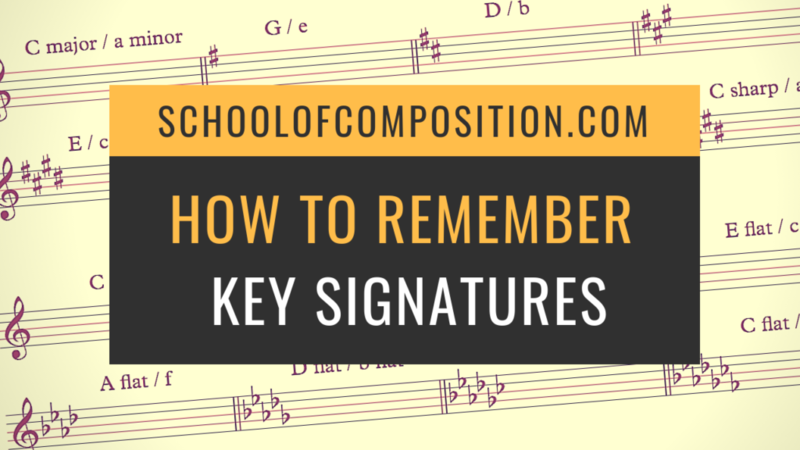 So how do you remember key signatures? You remember key signatures by counting up or down 5 steps. Starting from C major (which has no sharps and no flats) count 5 steps forward to get sharp keys and count 5 steps backwards to get flat keys. Let’s dive right in and see what this means exactly. Why do we need Key Signatures at all? Now before we get into the details, what’s the point of key signatures in the first place? If you’ve read this lesson about how many major scales there are and why, then you know that we need sharps and flats so that the major scale pattern is the same no matter which note it begins on. In that lesson we learned that the major scale pattern consists of a specific layout of half steps (shortest distance possible) and whole steps (equal to two whole steps). The same half steps and whole steps notated on the musical staff. The sharps and flats of all key signatures are there so that no matter which note our major and minor scales start on, that pattern of half steps and whole steps is always the same. And since the pattern is the same, we get the same sound (except that it begins higher or lower). For example, the scale of G major requires an F sharp so that the distance between the 6th and 7th notes is of a whole step, and the distance between the 7th and the last note is of a half step. These steps are according to the major scale formula. The scale of G major requires an F sharp so that the pattern of whole steps and half steps is according to the major scale formula. The same applies to every key signature no matter if it is major or minor and no matter if it has 2 sharps or 6 flats or nothing at all. The point is that the sharps and the flats maintain the right major and minor scale patterns. We also need key signatures because they make it easier to read and write music. Instead of getting all the sharps and flats in the score amongst the notes, we get them neatly at the beginning of every stave. Key signatures are shown at the beginning of every stave just after the clef. They also make it a lot easier to figure out which key we’re using. Every key signature narrows down our possibilities to just 2 keys: one major and one minor. (We’ll discuss how to know which one later). In this section we’re going to start from scratch and build up ALL 15 key signatures step-by-step. In doing so we’ll recognize the patterns that will later help us identify any written key signature. How we’re going to do this: we’ll start with the key signature of C major because that’s the key without sharps and/or flats. Then we count 5 up and that gives us the next key with a new sharp. 5 up from that brings us to the next key with yet another new sharp and so on. We keep counting in this way always moving 5 steps up from the previous key until we get to C sharp major. For the flat key signatures we’ll follow the same pattern but instead of counting 5 up, we count 5 down. Every new key here will have a new flat until we get to C flat major. Here’s a detailed run down of this process broken down into 5 steps. The first step is simply to start with C major. This key signature is first in because it has no sharps and no flats. It shouldn’t be too hard to keep this in mind. Now, let’s move forward with the key signatures that have sharps. The way the pattern works is simple: Count up 5 steps from the current key and that’s our next key signature name. Every one of these new keys will have one more sharp than the one before it. So we start with C major that has no sharps or flats. The next key signature is 5 steps up from C and it will have 1 sharp. The next one is 5 steps above that and it will have 2 sharps. The next key will have 3 sharps and it’s 5 steps above the one before it and so on the pattern goes. So what note is 5 up from C major? The answer is G (so the key signature that is next in line is G major). Notice that when counting up in this way, the first note is counted as ‘one’. Counting 5 up from C gets us to G.
What’s 5 up from G? The answer is D (so the next key signature is D major). Counting 5 up from G gets us to D.
Counting 5 up from D gets us to A. The names of the sharp key signatures in order from C to C sharp. Notice that 5 steps up from B brings us to F sharp (not F natural). The distance between B to F natural is a different kind of 5th and it’s not what we need in this sequence. Now let’s do the same for the flat keys. Instead of going up, we count down 5 steps from the current key signature and that brings us to the next one. Every new key will have one more flat than the one before it. Counting 5 steps down from C gets us to F.
You can also count 4 up instead – it will bring you to the same note. So counting 5 down from C brought us to F. That means that the first flat key is F major and it has 1 flat. The next key will be 5 down from F and it will have 2 flats. Counting 5 steps down from F gets us to B flat. Counting 5 steps down from B flat gets us to E flat. The names of the flat key signatures in order from C to C sharp. C, G, D, A, E, B, F sharp and C sharp. C, F, B flat, E flat, A flat, D flat, G flat and C flat. Now we need to figure out what the sharps and flats actually are. Let’s take the sharp keys first – every new key gets another sharp. That means that C major has no sharps, G major has one sharp, D major has 2 sharps, A major has 3 sharps and so on until we get to C sharp which has 7 sharps (all of its notes are sharpened). The names of the sharp key signatures and the amount of sharps they get. Same thing happens with the flat keys. C major has no flats, F major has one flat, B flat major has 2 flats, E flat major has 3 flats and so on until we get to C flat major which has 7 flats (all of its notes are flattened). The names of the flat key signatures and the amount of flats they get. Once again we’re just counting 5 up. Just keep in mind that it begins on F.
This is our sequence of sharps. F is the first sharp, C is the second sharp, G is the third sharp and so on. From steps 1 to 4, we already know which keys get 1 sharp, 2 sharps, 3 sharps, etc., so all that is left is that we pair them up. The arrangement of the flats is exactly the same but the sequence goes in reverse order of the sharps. So instead of F – C – G – D – A – E – B we get B – E – A – D – G – C – F.
That means that the first flat is B flat, the next is E flat, the one after that is A flat and so on. The formula keeps going until we get to C flat major which has all 7 flats. So those are our 15 key signatures. 7 with flats, 7 with sharps and C major with none. 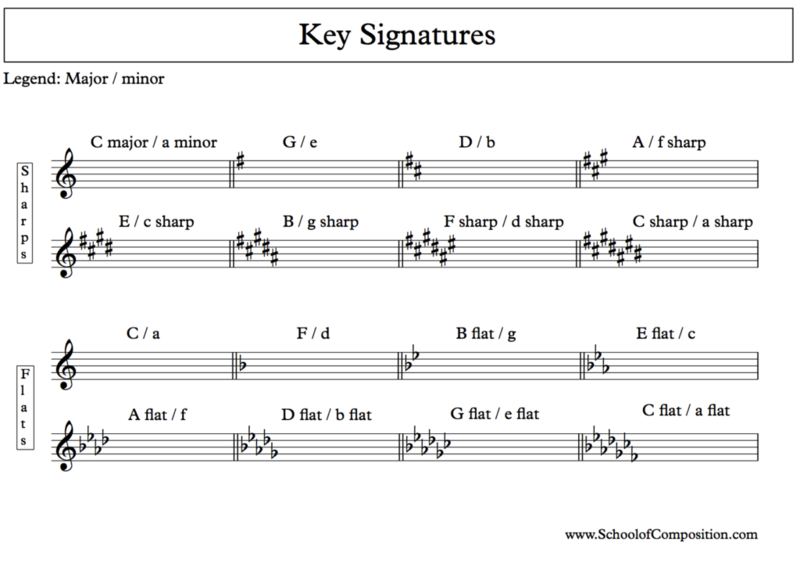 Every one of these 15 key signatures accounts for two keys: one major and one minor. And since these keys share the same key signature, they’re known as ‘relatives’. For example, G is the relative major of E minor. And E is the relative minor of G major. So once we know what the major keys are, we simply have to move the whole pattern down 3 half steps. When counting down, make sure you use 3 different letter names. For example, counting 3 half steps down from E major should get us to C sharp and not D flat. In this example, E is the first letter-name, D is the second and C sharp is the third. 3 half steps down from E brings us to C sharp. This means that the relative minor of E major is C sharp minor. In other words, E major and C sharp minor have the same key signature (that of 4 sharps). Let’s try another one. What’s the relative minor of F major? 3 half steps down from F brings us to D.
The answer is D minor. F major and D minor share the same key signature. So that brings us to 15 key signatures. As the chart below shows, each one is used for a major key and a minor key. Notice how the sharps and flats are written on the stave. The F sharp is on the top line, the C sharp on the 3rd space and so on. These positions are standard so you shouldn’t change them unless you really have a good reason to. Once we know how to build a table of all key signatures from scratch, it’s much easier to figure them out. The last sharp of any key signature is 1 half step below the key name. (Example: The last sharp of B major is A sharp, which is 1 half step down from B). For flat key signatures, the penultimate flat (that’s the one before the last) is the key name itself. (Example: When the flats are B flat, E flat, A flat and D flat, the key is A flat. When the flats are B flat, E flat and A flat, the key is E flat). To get to the relative minor from any major key signature, count 3 half steps (semitones) down. To get to the relative major from any minor key signature, count 3 half steps (semitones) up. From minor to Major count up; from Major to minor count down. If a key has a sharp in its name, it has sharps in the key signature too. If a key has a flat in its name, it has flats in the key signature too. (Example: C sharp minor has 4 sharps and E flat major has 3 flats). The table of key signatures works by counting 5 up from the previous key for the next sharp key; and by counting 5 down from the previous key to get to the next flat key. Every new key has one more sharp or one more flat. On the sharp side we begin on C major that has no sharps and finish on C sharp major that has 7 sharps. On the flat side we begin again on C major (though it has no flats) and finish on C flat major that has 7 flats. To figure out whether a key signature in sheet music is representing the major or the minor key, check out this lesson called “How to tell if the music is major or minor”. And that’s all about remembering key signatures. If this is the very first time you went through building all key signatures from scratch, you might have found some difficulties. I assure you that this is completely normal! Once you get used to these few patterns that we talked about today, you’ll know all the key signatures like the back of your hand. If you have any comments or questions, let me know below or join our Facebook community over here. We’d love to have you over!